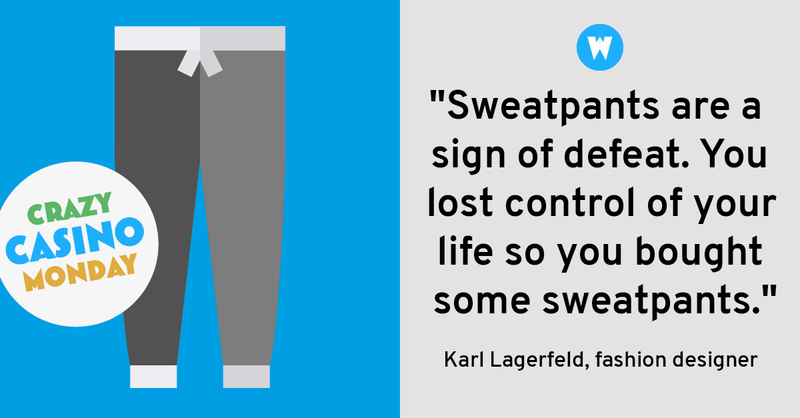 "Sweatpants are a sign of defeat. You lost control of your life so you bought some sweatpants." You have probably heard this quote from star fashion designer Karl Lagerfeld before. Here we contradict decidedly! The cosy garment has earned its own holiday. Since 2009, every year on 21 January is International Sweatpants Day. On this day, even nonhipsters wear the comfortable trousers outside the gym or the living room. Four students from Austria came up with the idea for the Sweatpants Day. They and their classmates came to school in sweatpants on 21 January 2009. What was actually meant to be a carnival joke, immediately enjoyed great popularity and was repeated the following year. The campaign also spread quickly over the Internet and people in around 50 countries are now wearing their baggy trousers on this day. Apparently, there are special theme parties with "sweatpants" as their dress code. Now one more question remains: Where did sweatpants come from? It was Émile Camuset, founder of the French sports brand Le Coq Sportif, who first sold simple knitted jersey trousers in the 1920s. They were intended to enable athletes to play outdoor sports in comfortable clothes during the cold months of the year. In the 70s, sweats finally became a mass phenomenon and many versions developed. They were also worn in discotheques in the 1980s. Towards the end of 20th century, the rap and hip-hop culture ensured, first in the USand later in Germany, that the casual trousers became an everyday outfit. Do you also have the desire to throw yourself into your sweatpants and lie on the couch? What are you waiting for? Make yourself comfortable at home with Wunderino. With our online casino you can immerse yourself in our gaming world and easily manage your winnings and stakes with PayPal. Free spins and bonuses also beckon regularly! So, let’s go! You want to visit a casino but don’t know what to wear? Here we tell you!